Always good to know about this!! For members and visitors at the lake, the end of the year promises an annual surprise to those who can stand near our fish ladder or any of the surrounding creeks and see salmon fighting their way upstream to do their yearly spawning. It’s an incredible experience for both the young and old. 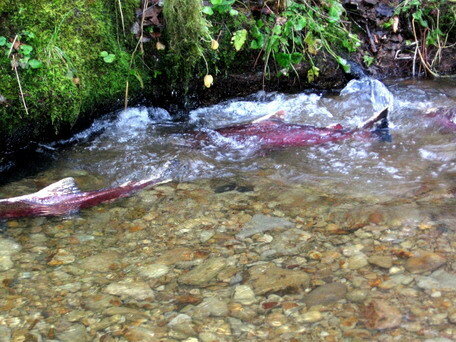 This year past, Nov. ’09 until end of January of 2010 saw a prolific number of salmon “doing their thing”. (Many carcasses have been found around the area since). 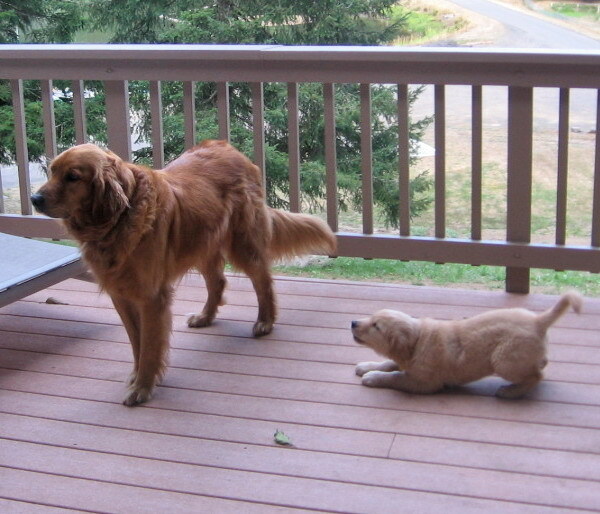 The attached article is one I wrote several years ago for our Fishhawk Lake newsletter(regarding our older Golden Retriever’s experience) and wanted to share it with those who have dogs who happen to enjoy either a)eating dead fish or b) rolling in dead fish or c) all of the above! It is imperative that we share this information because it can save you from heartache down the road. 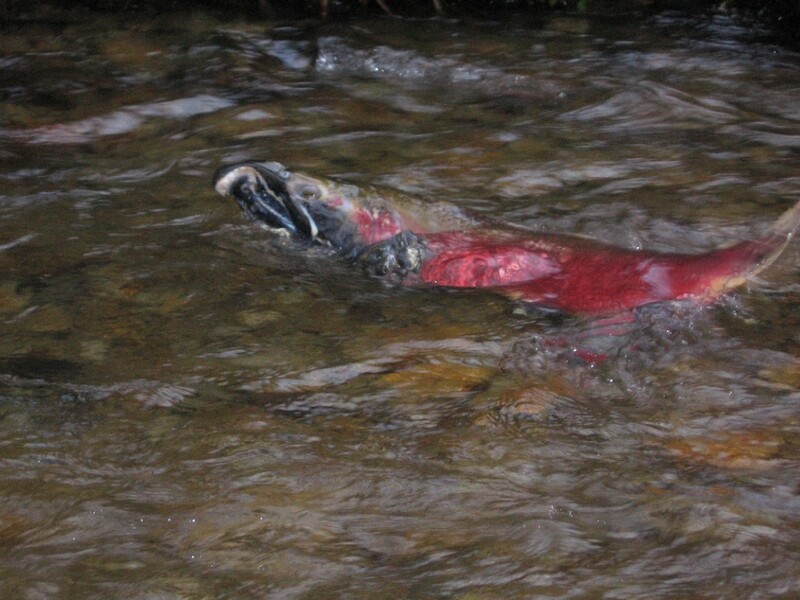 For a dog, getting salmon into its system can be lethal if not caught in time. My following article will spell it out for you. This could happen at other places where fish thrive, so being aware is half the battle! We have a new Golden Retriever puppy, Takoda, whom we acquired as a new family member last summer and when fall hit and so many salmon began spawning, I quickly realized that our pup could find them easily and everywhere and I spent many months off and on giving him tetracycline to keep him from succumbing to sickness and death.He just kept finding it!! I actually have a friend who didn’t recognize the symptoms until it was too late and she found out that her dog did not die from “old age” as she figured, but from salmon poisoning disease. However, she was able to save her younger dog, who had gotten into the salmon about the same time that her older one did, but she got him to the vet just barely in time and saved his life. It can present as many things and if you are not aware of this, then the veterinarian may not know to test for it. Click on the article included for more valuable information. 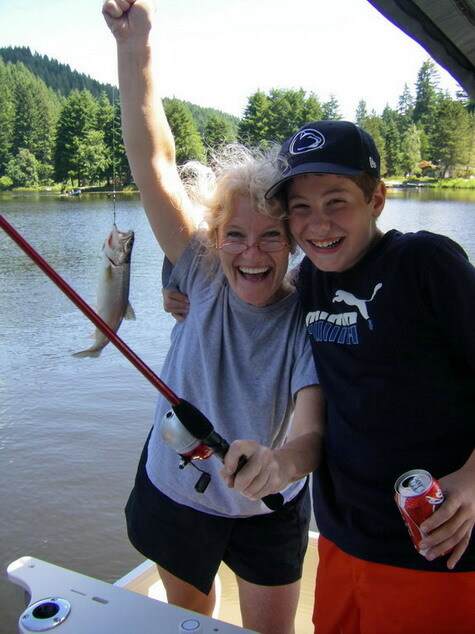 Both survivors of salmon poisoning (SPD)!!! This entry was posted in Common Questions About Fishhawk Lake, Fishhawk Lake Community Information, Fishhawk Lake Folks, Fishhawk Lake Real Estate, Fishhawk Lake Seasons, Living on a Lake in the Country, Localism, Nature, Nature at Fishhawk Lake, What Lives in our water, What' in the Water, What's in the Water on Fishhawk Lake and tagged Fishhawk Lake activities, Information for dog owners, lake fun, nature at Fishhawk Lake, Pet friendly real estate, resources, Salmon habitat, things to do at Fishhawk Lake, Wildlife. Bookmark the permalink.